3ouyet hi s SO wtifi tnsin power unit, tropicultor, and moldboard plow on a mechanical lift. Bouyer powered with either an 8 or 10 h.p., air-cooled engine with special equipment for operating in tropical climates. The two-belt transmission operates a high and low range for two forward and one reverse speed. 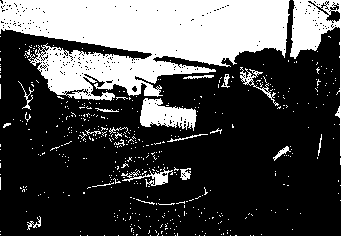 It is not clear whether or not the power section is designed for use without the tropicultor. However, it does appear that the tropicultor was designed to allow the power unit of a walking tractor to function with attachments for cultivation, plowing, asd seeding larger than those of most walking tractors. It is equipped with a mechanical lifting device but no power take-off. 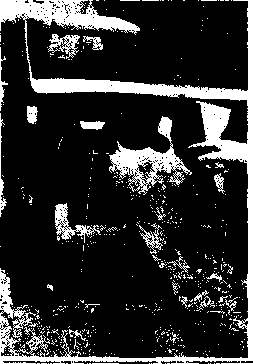 Attachments include a subsoiler, a ten-inch moldboard plow, a spring-tooth harrow, a nine-tine chisel plow, and a three-row seeder. The flexible network of universal joints linking ti PTO shaft ' hay baler. 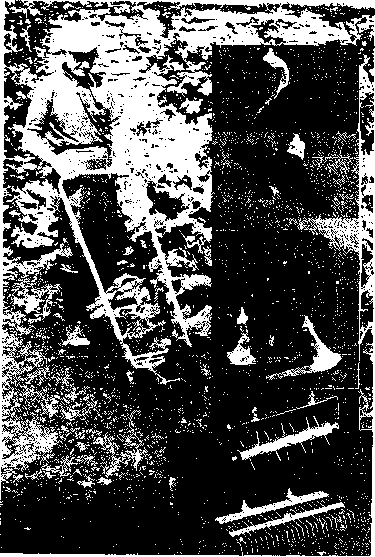 The fmger points to a power-lalte-off shaft on an old model tractor with a pull-type hitch. the investment in a separate motor; so the PTO offers considerable savings in capital output here. point flitch and will accommodate only All is-Cfinlmers machinery built for it.) 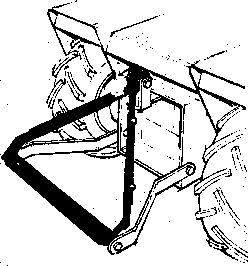 The three-point hitch (by which a tool hitchcs to two points on the drawbar and one above) makes hitching, transport of machinery, lifting, lowering, and depth adjustments relatively easy compared to older methods. 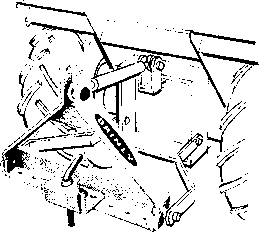 Today, three-point hitches can be purchased and fitted to almost any tractor. Pnll-type tools are not to be ignored, however. If you are willing to give up some convenience. and especially if machinery does not have to be transported over the road, older implements can be used which offer a considerable saving. Three-point hitches and tools to fit them are in a higher price range than the same equipment in pull-type models. Particularly when buying an older tractor. Circled at? 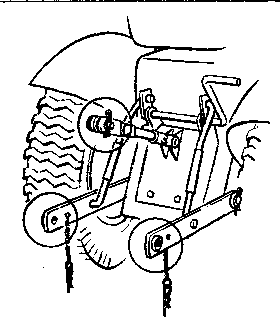 the three points of attachment for a hy-drauiieally powered lifting hitch. a general rule to consider is to be sure that you know what equipment will or will not fit your tractor. The ideal is to buy your basic machinery—plow, disc, planter, mower, cultivator, and others—together with the tractor on which they have been mounted. Many small tractors come equipped with three-point hydraulic lifting hitches which do not fit the many pull-type tools made for small form and garden tractors. Brinly-Hardy makes the following adapters to convert three-point hitches into pull-type on 14 to 18 h.p„ category 0 tractors. 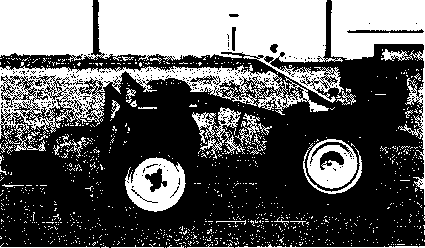 This unit was designed for adapting sleeve-type hitch implements for use on tractors equipped with category 0 three-point hitches. It is required for using Model KK-305 Planter-Fertilizer, TT-I00 Toolbar and BB-363 Fork Lift Kit. Weight: 28 pounds. This unit includes cross-type drawbar and two adjustable support links for drawbar weight control. Use it for general-purpose trail-behind attachments. Weight: 18 pounds. tracks or for intercropping techniques. When cultivating, any number of chisels or sweeps can be mounted on a tool bar in any complementary combination. The tool bar also offers a savings in investment in that only a simple bar clamp is needed for the link between tool and tractor rather than separate hitching hardware, which can be especially complicated and expensive with three-point hitches.